If you’re trying to pack light it can sometimes be a problem when you want to buy some extra stuff or go on weekend trips while traveling. The solution is to pick up a small bag to actually pack in your main carry-on bag. 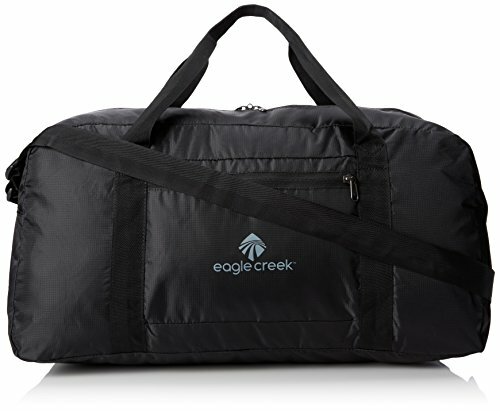 One of our favorites right now is the Eagle Creek Packable Duffel bag. Need an even smaller and more lightweight packable duffel bag? Check out this crazy small one from Sea to Summit. It’s so small that it fits on a keychain! This lightweight packable duffel comes stuffed into itself actually. You simply unzip it and unroll it into a full 46 litre duffle. It features durable handles as well as a full shoulder strap which is handy. A lot of similar sized packable bags actually don’t come with a shoulder strap. The bag material is made of a very durable 150D polyester ripstop fabric. Eagle Creek excels in this area and have made a very solid bag here. The main compartment on the bag is fully lockable with dual zippers. When fully folded up and stowed, the bag is only 8″ x 5″ x 1.5″. I have personally taken this bag with me on a 2 week trip overseas and came in very handy for overnight trips as well as piling in a bunch of clothes on my return trip. This way I basically can almost double my packing capacity on my return flight (after I have bought a bunch of stuff on my trip). Not sure what to pack for your next trip. We have you covered with the most comprehensive packing list on the internet.